We offer basic information about what we've learned from our blind horses at Rolling Dog Farm. We run a non-profit in New Hampshire called the Rolling Dog Farm that specializes in caring for disabled animals. We had originally founded the nonprofit at our ranch in Montana in 2000, then known as the Rolling Dog Ranch Animal Sanctuary, but moved the operation to New Hampshire in 2010 and changed the name once we got settled in the new location. Being a "ranch" didn’t fit in New England and everyone here called us a farm anyway! Over the years we rescued and cared for many different types of disabled animals — our residents included blind dogs, blind horses, blind cats, three-legged dogs, and both dogs and cats with neurological and orthopedic issues. While we focus primarily now just on disabled dogs, we still have a blind horse. And as it turns out, that blind horse was also our very first resident way back in 2000 … a blind Quarter Horse named Lena. This lovely chestnut mare showed us how a blind horse can have a wonderful quality of life, if only given a chance. That’s her in the photo above. We also learned from Lena that blind horses are very special animals: Trusting, appreciative, and still very much themselves. On one level their disability does not affect their personality at all: A calm, centered, easy-keeper like Lena is going to remain that way, blind or not. Of course, in the process of going blind – or suddenly losing sight altogether – a horse can become frightened and confused, just as people do. And, left untreated, the pain caused by some eye diseases can temporarily affect their personalities. Yet we’ve found that handicapped animals in general are quick to accept and adjust to their disabilities. This is true of blind horses, who just want to be … well, horses. All of the blind horses we have been blessed to care for do remarkably well. Visitors often don’t realize that the horses wandering through a pasture or ambling across a corral are blind. It’s clear to us that blind horses love life, and they deserve to live out their years enjoying themselves. We created this Web site because of the e-mails and calls we get from people who have just learned their horse is going blind. They have friends and relatives telling them to put the horse down. 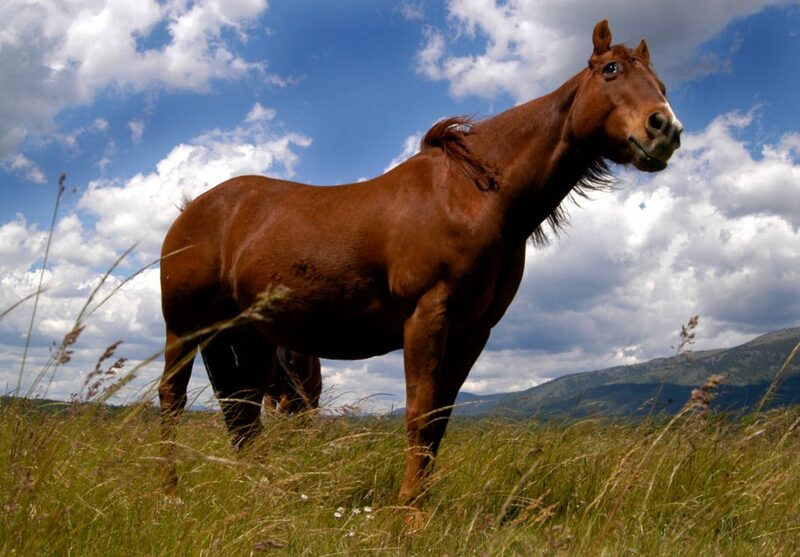 Too often we hear that a vet is also recommending euthanizing the horse, and not offering the owner any other options. These folks typically have found our main Web site and read about our blind horses there. They ask us what it’s like to care for a blind horse, and for tips and ideas on their particular situation. Most important, they want to know what kind of life a blind horse can have. So we developed this site as a resource for owners of newly blind horses. We are not horse "experts" by any means, and we don’t pretend to be. We just want to offer some basic information about what we’ve learned from our blind horses, and to show you what wonderful animals they are. Our single most important message is this: Your blind horse can have a wonderful, enjoyable life! Give it that chance. Your blind friend, living in its newly dark world, will come to cherish and depend on you like never before. The two of you will learn to communicate in a new way. And your life will be richer for it. P.S. Just a brief note about the photos on this website: Except for the photo of blind Lena at the top of this page, the other horses you see on this site are from stock photos we purchased from Shutterstock. That’s why some appear in settings that might not be those we would necessarily recommend for a blind horse. Unfortunately, when it came time to update this website in 2019, we were not able able to retrieve the photos of our own blind horses that were on the original version of the website; the images we needed were on a long-dead, inaccessible computer. So in the interest of transparency, we just wanted to point out that while these are indeed beautiful horses and terrific photos, they were not our horses you’re seeing. A blind horse can enjoy life just like a sighted horse. However, going blind can be a frightening experience for both the horse and the owner. Your horse may be upset and scared (and who wouldn’t be?) by the encroaching darkness. You’ll worry about how to care for your newly blind friend. And plenty of people will probably start telling you to put the animal down. They’ll say your horse can’t have a good quality of life if it’s blind. Well, we’re here to tell you differently. This site will help answer questions you may have about caring for your blind horse. Blind horses all have one thing in common: They may have lost their vision, but they haven’t lost their ability to enjoy all that life has to offer. Give them a chance to show you how well they can do.